Donald Trump believes it's time to dump stocks. In an interview with Fox Business on Tuesday, Trump was asked if he has money in the market now. "I did, but I got out," Trump replied. He warned of "very scary scenarios" ahead for investors. This isn't the first time Trump has advised Americans to steer clear of stocks. In October of last year, he told The Hill that the stock market is in a bubble. The stock market has gone up more than 6% since he made those comments. "The only reason the stock market is where it is, is because you get free money," Trump said. Trump slammed America's central bank -- the Federal Reserve -- for keeping interest rates at extremely low levels. People can borrow money at cheap rates. Meanwhile, they earn almost nothing if they save money in the bank. This encourages people to take risks. But famed investor Warren Buffett says don't take stock advice from Trump. "I've really never known another businessman that brags about his bankruptcies," Buffett said Monday as he introduced Hillary Clinton at a campaign event in his hometown of Omaha, Nebraska. 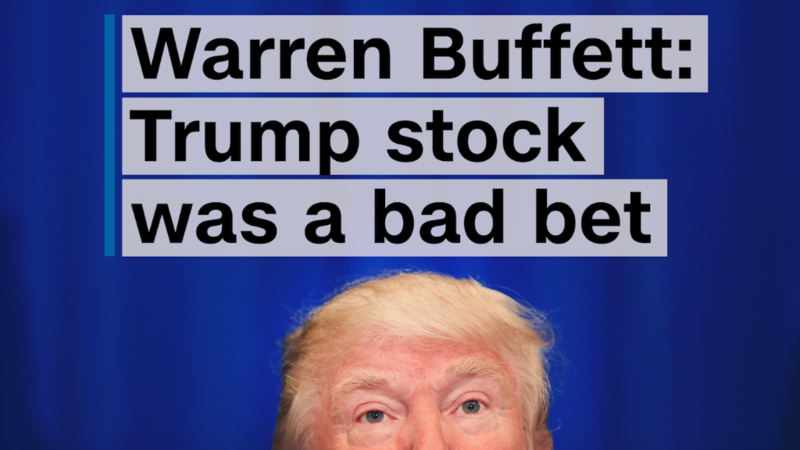 Buffett said a monkey throwing a dart at the stock pages would have done far better than investing with Trump. He was referring to the one company Trump has ever run that went public and offered stock that anyone could buy. Trump Hotels & Casino Resorts -- ticker "DJT" (Trump's initials) -- was a big loser for investors before the company filed for bankruptcy. While Trump often touts his success as a businessman, he doesn't typically brag about his prowess as a stock picker. "I've never been a big investor [in] the stock market," Trump reiterated this week. Real estate makes up the bulk of Trump's $3 billion fortune. Properties such as the Trump National Doral in Florida and Trump Tower in New York are worth hundreds of millions of dollars. In fact, less than 10% of Trump's wealth is in the stock market, according to a CNNMoney analysis of his financial disclosures. Wall Street experts are mixed on whether now is a good time to invest in the stock market. Goldman Sachs just warned its clients to go heavy into cash for the next three months. But other strategists point out that U.S. stocks and bonds still offer some of the best investment opportunities since America is a "safe haven" right now. There may be another reason for Trump to want the stock market to tank. An analysis shows that if stocks fall between August 1 and October 31, it's a signal that Trump will likely win the election.